Hollywood’s portrayal of the corporate underworld—where the thirst for profits all too often outweighs the welfare of the innocent—has finally broached medicine’s dirty little secret: the design of medical needles presents a very real hazard to your health. According to the film Puncture, which is based on a true story, Big Med is led by a few giant corporations that control the lucrative manufacture and marketing of needles in America and around the world, and the leaders of these powerful monopolies will stop at nothing to keep the profits rolling in regardless of who is harmed in the process. Puncture stars Chris Evans of Captain America fame as an attorney representing a nurse named Vicky (played by Vinessa Shaw) who died from HIV contracted through a needlestick accident. 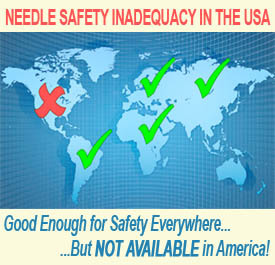 In fact, nurses and other healthcare workers are forced to use flawed medical devices every day, and thousands get stuck with contaminated needles each week due, not to poor practices on their part, but because the needles they are forced to use are inherently dangerous.